Perfect picture of a winter paradise, minus the phantoms of course! Frozen in ice and covered under the fresh snow, the phantoms have broken free of their icy prison! Taking unsuspecting mice by complete surprise as they look in awe at the seemingly frozen sculpture before it springs to life! "Ice to see you!" No one suspects the tree! The Festive Phantasmic Oasis Skin can be used on Phantasmic Oasis Trap. The trap's stats (power, power bonus, attraction bonus, etc.) are not changed. The Festive Phantasmic Oasis Skin may be made available during the annual Great Winter Hunt event and can be traded on the Marketplace or through Give To Friends. 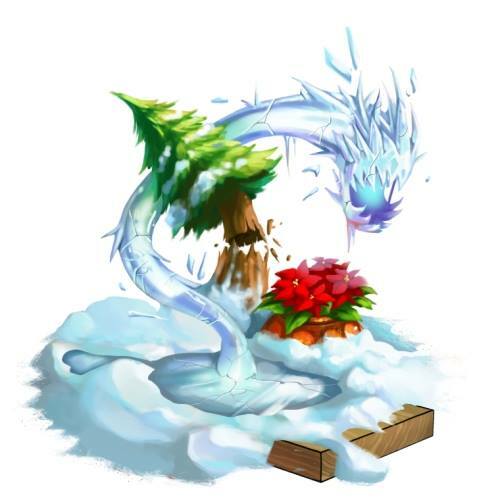 10 December 2013: The Festive Phantasmic Oasis Skin began dropping as loot from the Snowflake Mouse at the start of the Great Winter Snowball Fight event. It could also be obtained from the Festive Skin Pack (either by direct Donation or from the Marketplace). This page was last edited on 9 December 2017, at 11:41.